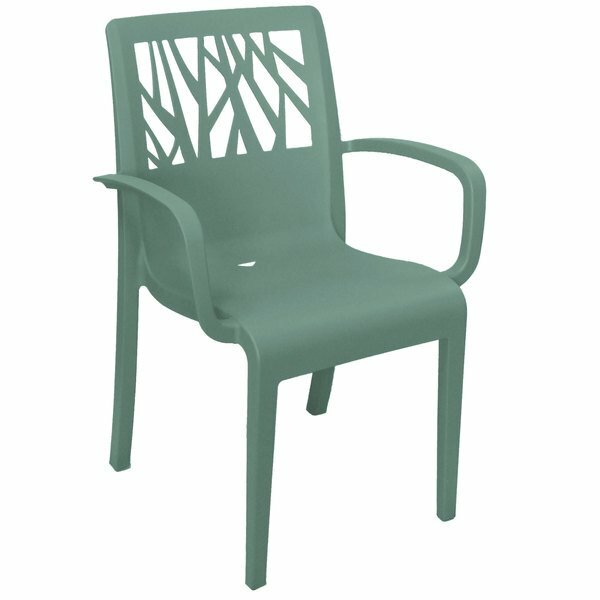 Seat guests comfortably in the shade or sun with this Grosfillex US200721 Vegetal sage stacking arm chair! This attractive chair is well-suited for commercial use and won't get hot or fade in the sun. The resin material is made with air molding technology for superior durability so this chair can withstand repeated use. Perfect for outdoor cafes, resorts, and pools, the sage color provides a versatile addition to your outdoor furniture. With its solid one-piece construction, this Vegetal chair is easy to maintain and clean with just soap and water to keep it looking new. The back of this chair features a unique pattern with organic shapes for a contemporary look, while its arm rests promote a more comfortable fit for your guests. Its stackable, lightweight design makes it easy for guests and staff to move around in your outdoor dining area. Plus, nylon glides are included to resist abrasive surfaces and make it easier to slide the chair around.